So, do you want to be a multimillionaire? 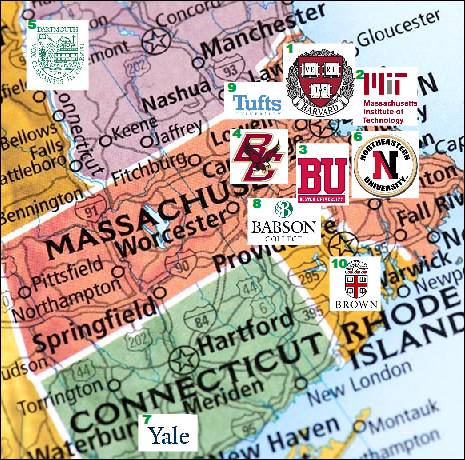 Which New England College or University should you attend? New Data from AffluenceIQ, a database of the 2,000 richest people in Massachusetts, ranks the top schools to attend for those itching to attain super wealth. Combing the educational backgrounds for 1,825 residents of Massachusetts with net worth estimates of $10 million or more, AffluenceIQ reveals the schools most frequently attended (for undergraduate and graduate studies). Contrary to Thomas Stanley’s “The Millionaire Next Door,” which counterintuitively deduced a significant number of millionaires are less educated and employed in blue collar occupations, AffluenceIQ’s data suggests that among multi-millionaires, education is paramount. Of the 1,825 profiles scrutinized, more than 85% attended college, and more than 55% had graduate degrees. And if anyone says a Harvard degree isn’t an important ingredient for accumulating mega wealth—they should think again. While certainly not a prerequisite for attaining super affluence, Harvard graduates represent a staggering 23% of Massachusetts’ uber rich. Approximately 18% of Massachusetts’ richest attended Harvard Business School. “One of the most fascinating aspects of this database, is how a premium education is a common underlying factor among the super wealthy,” said Publisher Michael Stern. “Even in industries like construction, wine distribution, and beer making—segments which one might think require less education—we found highly educated CEOs. Examples include Anthony Consigli, who runs Consigli Construction; Carl Martignetti, who co-owns wine distributor Martignetti Companies, and Richard Doyle, who co-founded Harpoon Brewery – all three of whom attended Harvard. Education is one of many details AffluenceIQ gathers when building its dossiers on Massachusetts’ wealthiest people. Every profile contains a detailed biography, career accomplishments, list of charitable endeavors, educational background, and verified home address. Most profiles also include email addresses, work contacts, personal phone numbers, as well as social media links. AffluenceIQ is the only Database providing intelligence on the highest net worth families in Massachusetts. With your one-year subscription, you'll have unlimited access to more than 2,000 profiles of individuals with a net worth of $10 million or more. Find new clients and donors today. Sign up for a free demo at http://affluenceiq.com.